A weekly newspaper has mimicked one of history’s most famous recruitment posters to highlight a new police campaign. The Cornish Guardian adapted the iconic ‘Your Country Needs You’ poster from the First World War for the front of this week’s Bodmin edition after a local Inspector launched a bid to get readers to become police support volunteers. The volunteers give their time to help out police officers and staff, freeing them up to focus on their key duties. The original poster from 1914, which features Secretary of State for War Lord Kitchener, has since been imitated in recruitment drives across the world. 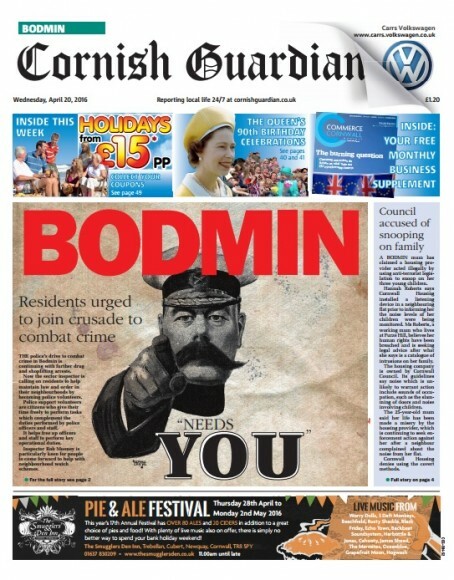 Guardian news editor Steven Smith said: “As our acting editor, Scott Harrison, and me discussed how to treat the story, the idea of ‘Bodmin needs you’ came to mind and, in turn, the famous World War One poster of Lord Kitchener. “Rather than do a straightforward front with what would have likely been a fairly general picture of police and/or Bodmin town centre, we thought we’d go for something eye-catching using the poster. “We challenged one of our subs, Laura Voaden, to run with the idea and we think what we ended up with was eye-catching and different. An iconic poster, which becomes gradually less iconic every time someone drags it out for a story like this. This isn’t a ‘different’ idea. It’s tired. It’s been done so many times before – by so many people. Claiming it as doing something different is rather silly. In the trenches and over the top with you sir! Someone desperately short of a new idea comes up with a very old one. But that’s local journalism for you now. Coming soon…typewriters and black and white pictures.